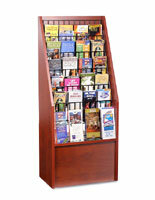 Rich Red Mahogany Finish Provides Sophisticated Look. 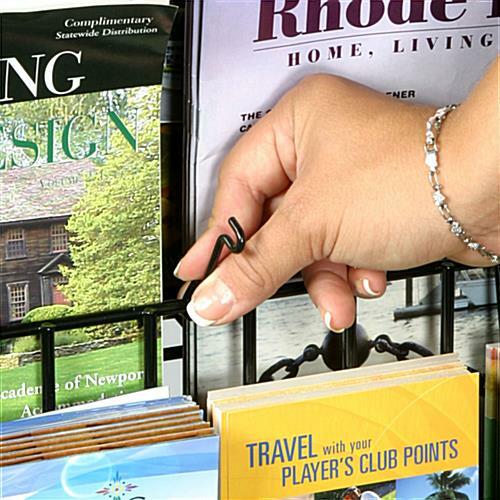 Wire Dividers are Adjustable to Display Magazines & Brochures. Ships Broken Down to Save on Delivery Costs. 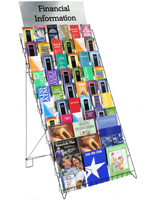 The 9-tier upright brochure stand is made of laminated MDF and wire shelving. 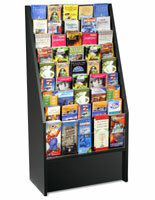 The freestanding literature rack is able to hold up to 45 pamphlets and the adjustable dividers also allow for larger print materials. 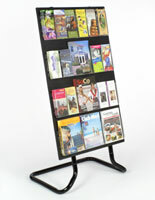 The brochure stand with multiple levels has 5 pockets across and each measures 1” deep. 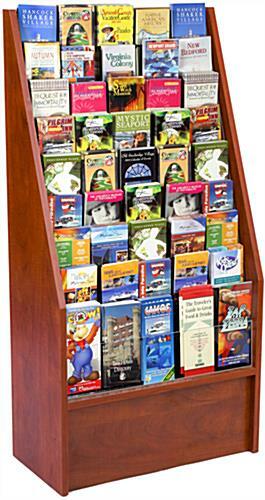 The laminate-covered holder comes with a cherry mahogany finish to present an upscale literature rack that can be presented many places. 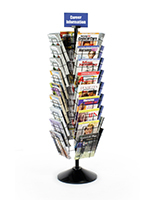 The stand is created to be sturdy and will last in busy retail locations or visitor centers. 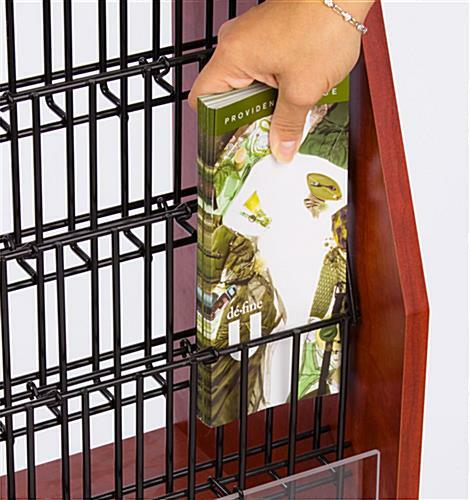 The wire pockets on the freestanding holder are 4.25” wide making them perfect for fitting your 4” wide pamphlets in them. We bought this to replace our old display rack and are thrilled with the purchase. 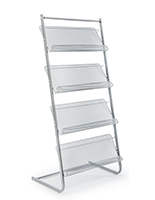 The adjustable wire pockets are perfect because we have several sizes of materials we display. There was one dent near the base of a side board but because of its location, we didn't need to get a replacement. If we expand, we will definitely purchase more of these. This is our second unit. Love the first one, couple of minor issues w/the one we're putting together tonight. However, am sure the great customer support folks will replace my broken cam. I won't even complain (too much) about the deformity in the plexiglass panel on the front. Doesn't affect structural integrity, so doesn't need replaced :) We'd still buy more and recommend them to others! 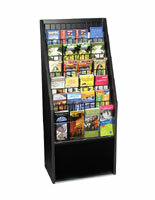 We are very pleased with our new brochure rack. It was a quick assembly, it's a beautiful color and we loved the fact it was affordable as well. We shopped around and found ugly and old looking racks for hundreds of dollars. 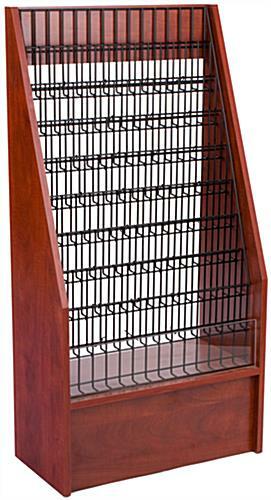 We are very pleased with this rack and that we received it in only a matter of days, not weeks later! Good job everyone! I really like the size, color and quality of the rack stand. It was definitely easy to assemble. 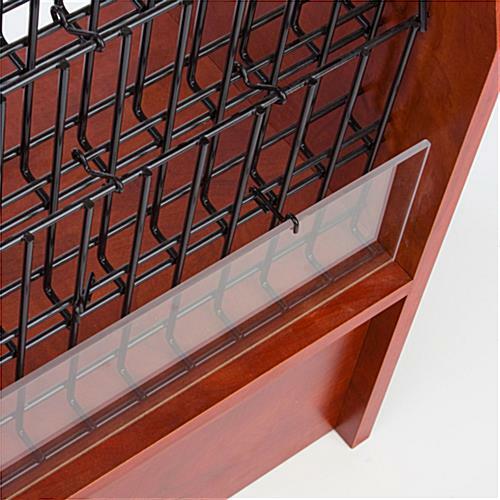 However, the rack came shipped with damaged wood corners and the metal holder was bent on one end so the brochures in that section are uneven. I am very disappointed. Was planning on ordering many more, but will have to find another company. 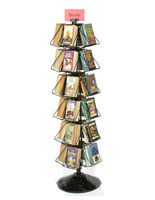 We are very sorry that your literature stand arrived damaged, Linnea. A customer care team member will reach out to you as soon as possible to replace this item. We are very sorry for the inconvenience but we hope to resolve your issue promptly.